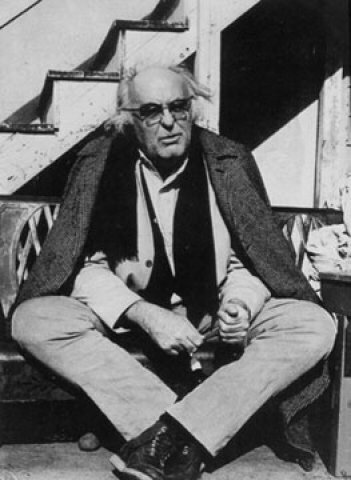 Maximus poet Charles Olson. Photo courtesy of Gerard Malanga. Sculpture sited on grounds of the gallery. Musician and multi media artist Willie Alexander. 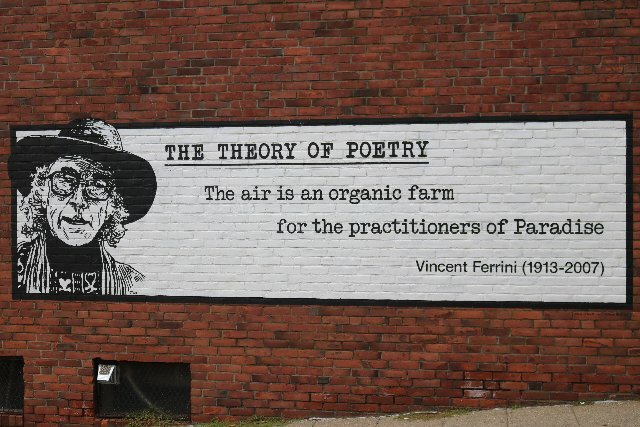 Poet Vincent Ferrini honored on downtown wall. 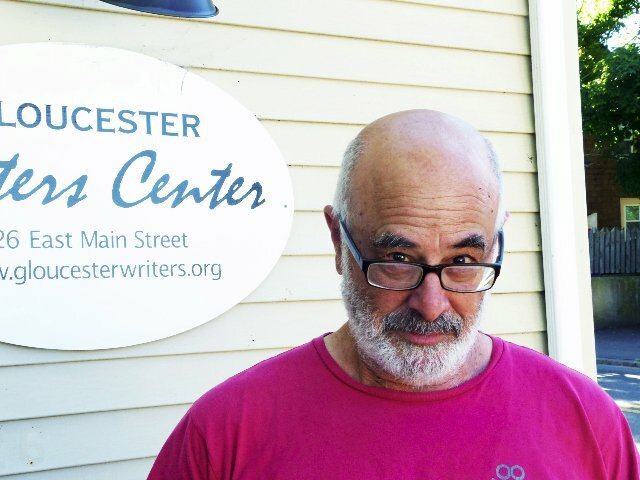 Henry Ferrini of Glooucester Writer's Center. Steve Nelson's best selling autobiography. Dealer in odds and ends Bob Driscoll designed posters for Nelson's Boston Tea Party. It shames me a bit to refer to these notes as letters. There is only one remarkable letter writer from Gloucester, Charles Olson. Between 1962-1969, Olson addressed citizens of his polis through letters to the Gloucester Daily Times. Urban Renewal was in full destructive mode. Bulldozing the elegant Greek revival at the corner of Middle Street for the construction of the YMCA reminds us of Olson’s unheeded screams. Yet his towering presence continues to watch over Gloucester like the statue of Our Lady of Good Voyage. The vibe is definitely here. Come for a listen. 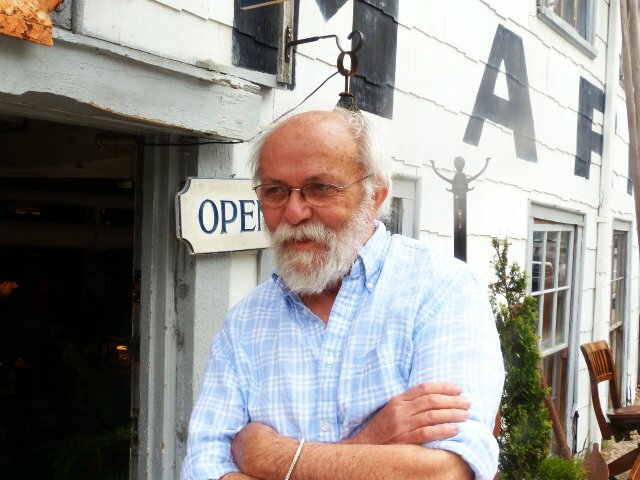 Saturday, October 27th, at 1PM, the Cape Ann Museum in collaboration with the Gloucester Writers Center will present the Annual Charles Olson Lecture delivered by Ed Sanders. Sanders, formerly of the Fugs, will punctuate his presentation with glyphs and anecdotes of his encounters with Olson. If you haven’t taken a dive into Olson’s work lately, this is a perfect opportunity to go exploring. A collection of his personal books are available for browsing at the Maud/Olson Library at 108 E. Main St., Gloucester. It is a beautiful space open on Tuesdays or by appointment. The mostly 3D work, Wrap it Up! 1 is on view until November 4th. A rousing opening for Wrap it Up! 2 will be November 10th. The curators do it right every time. 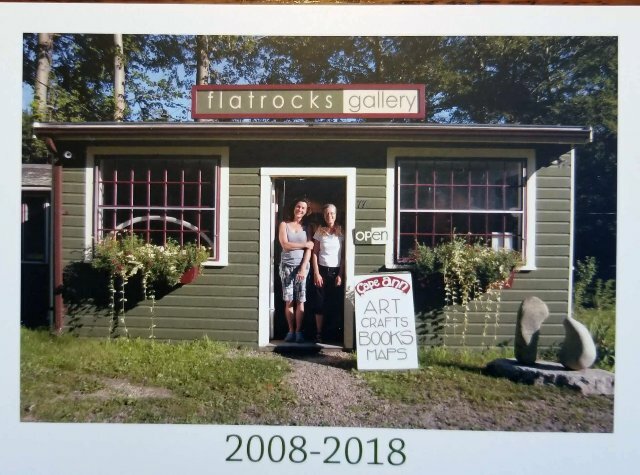 Cynthia Roth and Anne Marie Crotty have curated and managed Flatrocks for ten years. These two shows are their swan song. 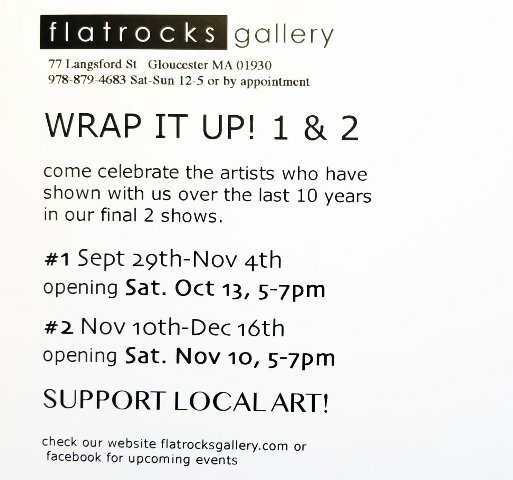 They invited all the artists who have shown with them over the years to exhibit their 3D and 2D work. 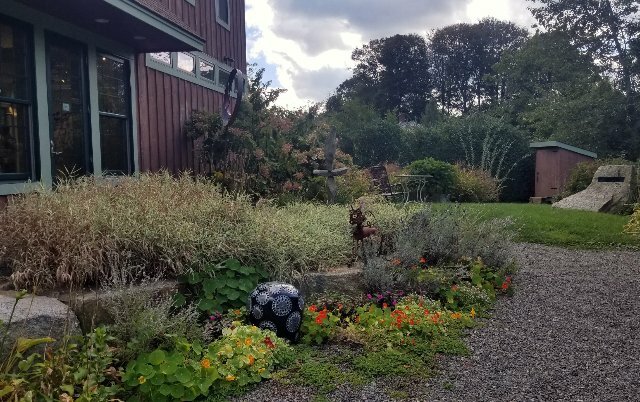 It is a who’s who of contemporary Cape Ann artists that you will kick yourself if you miss: HansPundt, Juni van Dyke, Dawn Southworth, Jay McLauchlan, Willie Alexander, Mary Rhinelander, Joy Halsted, Slim Larsen and Annie Melancon to name a few personal favorites. 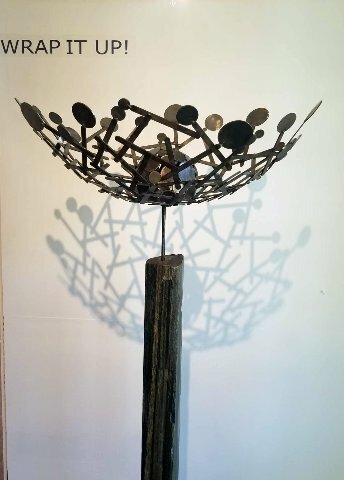 The shows are beautifully hung and sculptures find niches in the lovely garden outside the gallery. More to come in another letter featuring Roth and Crotty’s extraordinary effort to showcase contemporary art. Be there or….. 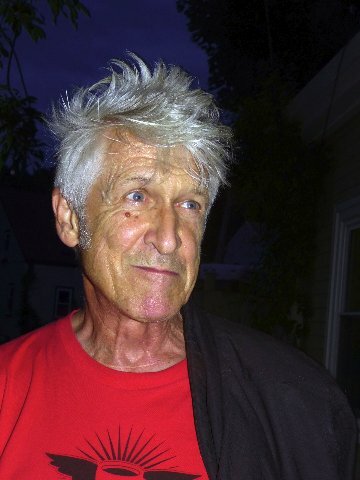 The visit was ostensibly to share Nelson’s autobiography with Bob Driscoll, who figures so prominently in the Harvard Square scene and later the Tea Party. 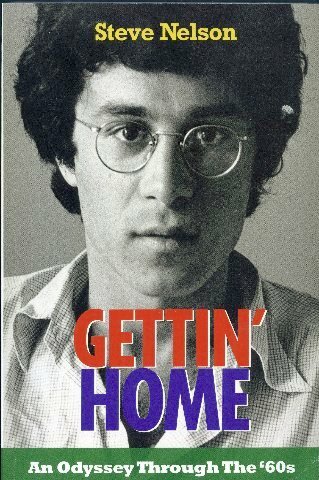 Bob has already sold six copies of Getting’ Home An Odyssey Through the ‘60s. Steve likes chocolate cherries from Nichols so treat him to a box and purchase his book through your local bookstore. Catch his antics from the high Andes to Charles’ squalid basement apartment in the square to the beauty, who captured his heart and imagination as she did ours, the lovely Jan Lewis Nelson. "I like the author's writing, her snippets of tone, at times dry and directing, familiar, moving you through town." "If only I had lots of Bob Driscolls everywhere, I would have a best seller."